Can you pass me those momos please? Because I want to dip them in this schezwan sauce multiple times till they are slathered in it, shove them in my mouth and become a fire breathing dragon! 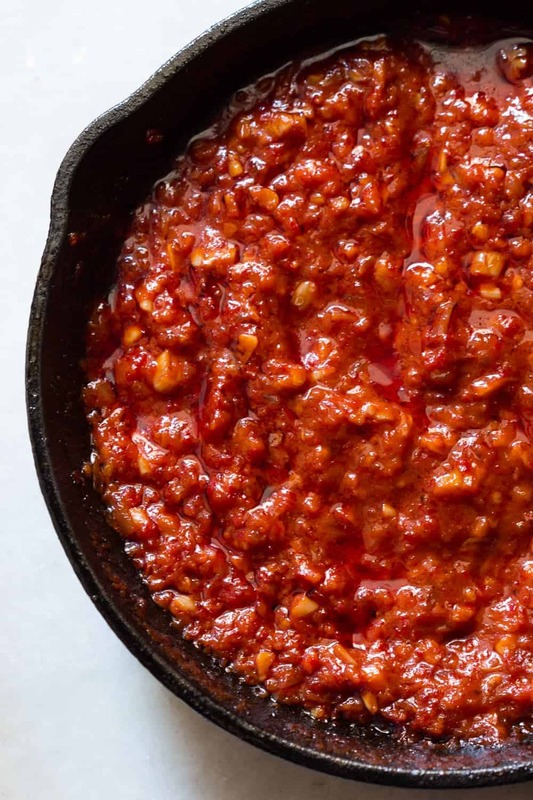 This sauce is made for every street side momo that you’ve ever eaten in your life. It’s sweet spicy and truly ‘indo-chinese’, meaning it’s probably born somewhere in India but served with chinese food. And today, let’s learn how to make it! It’s just one of those memories that two sisters shared while growing up, that only we think is funny anymore. I’d totally understand if you are a little weirded out. But papad + schezwan sauce = still my favorite snack! This schezwan sauce needs a loooot of red chilies, is fiery hot and as some foodies might say ‘definitely complex’. Because it’s sweet first and then spicy. You will definitely become a fire breathing dragon by the end of it, but will not be able to stop yourself from reaching out for more. Since I discovered it, I make a large batch at least once a month and use it for as long as it lasts. Do a triple schezwan with rice, noodles and crispy noodles – Triple reward! Like I said, this sauce is a win-win and there’s no turning back! If you try this out, tag your pictures #myfoodstories and give me a holler on Instagram, Facebook or Twitter. Learn how to make this simple indo-chinese schezwan sauce which goes really well with chicken lollipops, schezwan rice, noodles and manchurian. Heat oil in a pan and add garlic and ginger. Saute on a low flame till the raw aroma goes. Be careful not to brown or burn the ginger garlic. Add the minced onions and let them cook on a low flame. 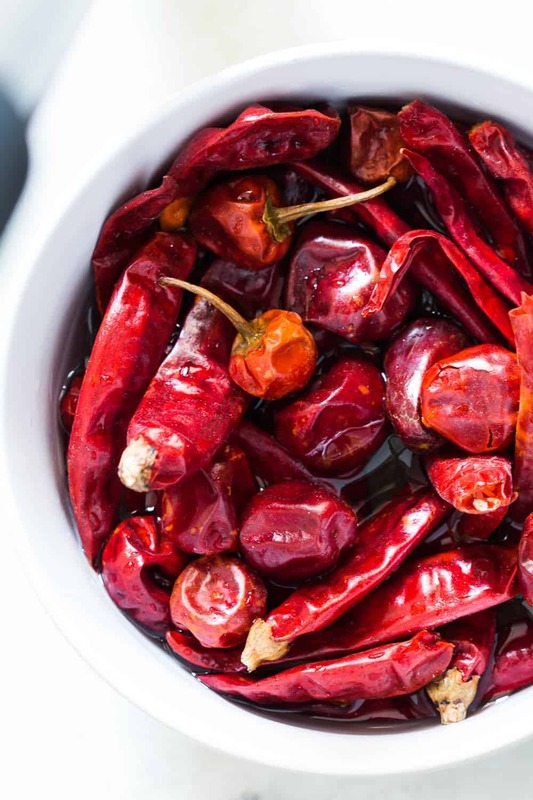 In the meanwhile, discard most of the water used to soak the chilies and grind the chilies with two tablespoons of water into a paste. Once the onions look like they are almost melting, add ground chilies, soy sauce, vinegar, ketchup, sugar, salt and 1/4 cup water. Bring this to a boil and simmer till the sauce thickens. Oil should have separated, and there should be some oil floating on top. Switch off the flame and let it cool. Once the sauce has completely cooled down, transfer to an airtight container and store in the refrigerator for up to 15 days. Hi are we supposed to de seed the red chillies before soaking? No, I don’t deseed them before soaking but if you want to cut down on the spice, you can do that Niyatee. I followed all the instructions given by u. Schezwan sauce returned out yummy in taste but I need more spicy. Suggest me what I can add to make it more spicy. I have already prepared the sauce 3 weeks ago. Can I add more chillies to it now. And if I m adding chillies, do I have to cook sauce again. Which Vinegar to use, white vinegar or brown Vinegar? Does the sauce stay only upto 15 days in the fridge? Hey Anuradha, I’ve actually kept it in the fridge for up to two months. The oil in the sauce preserves it for pretty long. Hey Sweta! Glad you liked the recipe. To reduce the spice, you can probably add a squirt of lime or some vinegar or some ketchup (ketchup may make it slightly sweet too). Thanks Romana – glad you liked it! Can we add sichuan peppers powder to it. Just wanted to know if it’s usually added in the indo Chinese recipes . Thanks. We love heat in our house. I will have to try this so we can add it to stir-fry. It would be perfect in a stir fry actually! 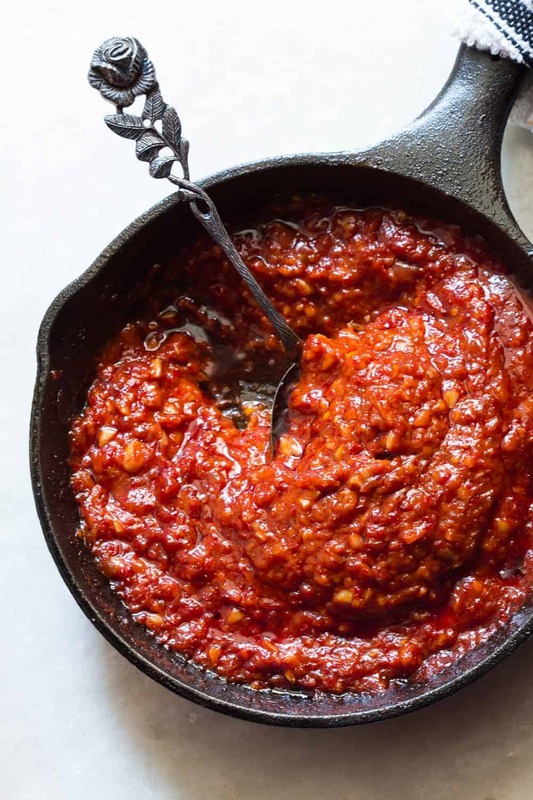 I love this spicy sauce, perfect as a dipping appetizer. Morty, I need the sauce Morty. 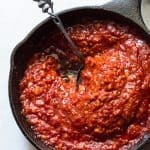 Your photos are so wonderful that I could almost feel my eyes burning from this sauce! I love the flavors and the colors as well; thanks so much for sharing! Thanks for trying it out Saranya and I’m so happy you liked it 🙂 I like the sauce a bit chunky but that’s a personal preference. Please feel free to adjust the consistency! Thanks for stopping by Gargi! Thanks Dolphia, I just wanted to focus on the food here! Forget the recipes – i just love the photographs! They are so gorgeous and powerful. 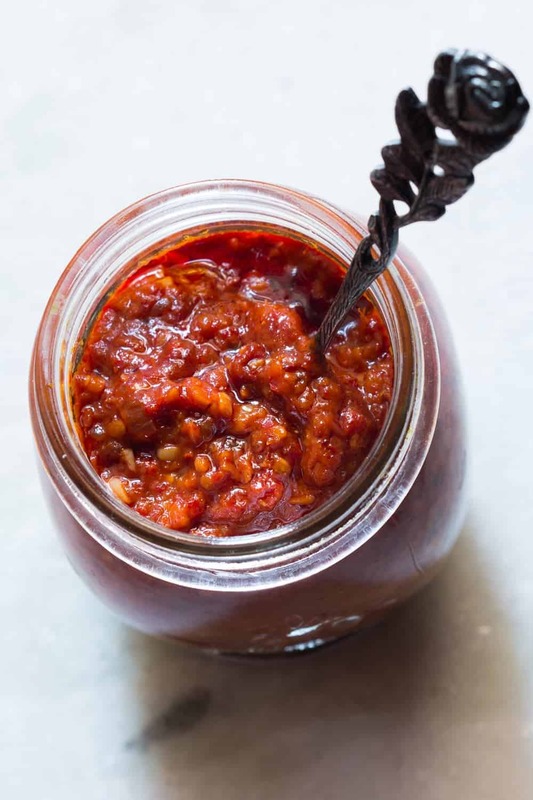 About the schezwan sauce – I hate chinese but I love schezwan cuisine for it’s heat. So love this recipe, will try sometimes 🙂 But again, the photos are breathtaking! Saved it and trying it for sure. Hope you like it Uma! Oh ! I am on an Indo Chinese Mode as the weather demands something spicy…such a timely recipe. Going to make it for the weekend Richa. Thanks Indu, loved recreating this recipe! So addictive! Red, red, red!!! Looking so good and hot!